Thus began our interview with Deepak Chopra, one that I quickly realised would be rife with such qualifications. While the language was in common, the meaning behind what we said was often chasms apart. Dr Deepak Chopra does not aim to teach us further information about what we already know and understand, but rather to teach us how to develop a new perspective on that which we take for granted as obvious. He is asking us to question the foundation of our belief systems – the perspective with which we approach the world. This is an example of what Dr Deepak Chopra emphasised as a key perspective shift in his talk, held at Emperor’s Palace, Johannesburg yesterday. As a specialist in neuro-endocrinology, he, and his colleagues, recognised that while they were studying the molecules of the brain, specifically neuropeptides, these could also be considered the molecules of emotion. Whenever you experience a strong emotion, a physical, chemical shift can be observed in the brain. He also realised the importance of the receptors, located all over the body, which these neuropeptides lock into. This chemical process is how the body communicates in order to function as a cohesive process. And because these neuropeptides are formed in the brain as the result of, or in order to, facilitate the process of thought, it became clear to him that all the cells in the body are “listening” to, and participating in, the ongoing mental conversation that we are having with ourselves. The cells can participate because they release the same molecules as the brain does when it is having an emotional response. Every aspect of this is an entirely chemical process within the body. Therefore it follows that the “intelligence” or consciousness in the cells of the food we eat (their chemical process) will also communicate with our cells in the same manner as they become absorbed by the body. This intelligence/consciousness is similar to that of our own, as it is created by one thing only – chemical processes. Suddenly referring to a heating process as diminishing “the intelligence of the food” makes sense, because we have understood the different perspective from which Deepak Chopra is viewing the world. We all know about nutrients and the necessity for our body to absorb them, this is the information and it has not changed. However, previously we came from a perspective of believing these nutrients to be dead objects that do not interact with our bodies in a relational manner but rather get absorbed and used up in a manner which lacks consciousness/intelligence. Now we have observed it from a different perspective, one which, if incorporated into our daily lives, would radically change the way we think about, and therefore interact with, ourselves and the rest of our environment. This “brain-body connection” is why your thoughts about the world and your experiences chemically influence your immune system, amongst other areas of your body. There is no magic here, only biology. He speaks of the microbiom – how 90% of our bodies genetic material is actually bacterial genetic material. We are more bacteria than human at any given moment. These bacteria also communicate with ‘the mind’ and respond to our levels of health. Your stomach recreates itself, discarding old cells and forming new cells, every five days. Your skeleton completes this process every three months. Therefore, we can see that our bodies are a dynamic process and not a set structure. With this understanding, Deepak Chopra’s comment of not minding how he is addressed, as he does not believe in assumed names, begins to make sense. How do you concretely name and bed down an ever changing form that is so intrinsically intertwined with its environment that we cannot be sure where “we” end and “the rest of the world begins”. We are an ecosystem. We don’t exist ‘within’ an environment we are the environment and it is us. 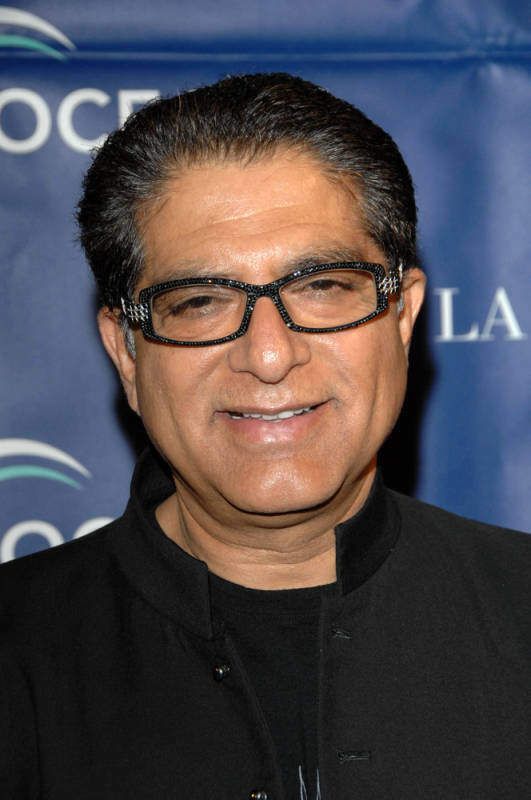 Having met and spoken to Deepak Chopra in person, I believe that his most fundamental message is that of perspective. Once you understand that it is our perspective that he is first and foremost tackling, you have the ability to truly question your own, irrespective of or own personal view of his teachings. He has identified a problem and is offering a solution. He believes that the perspective through which we are viewing the world is making us sick – psychologically and physically – and most of us are unaware of it. We need to become more aware our own perspective at any current moment so that we can truly start to question its usefulness in our lives. His solution is based on his medical studies and on the ancient traditions that he has found beneficial to his patients. Through yesterday’s interview and lecture, I learnt that it is of vital importance to question our underlying thought processes, those automatic assumptions that are inherent in the manner in which we view and approach the world. It is crucial that we understand the effect of the language we use on our brain-body processes (our health). And finally, that Deepak Chopra is a man widely misunderstood and misinterpreted by the mainstream scientific community, not because his scientific information is different, but because he has a vastly different perspective to that of mainstream medical belief. “Expiration (death) is the opposite of inspiration.” – Deepak Chopra, The Future of Wellbeing lecture 2015, Emperor’s Palace, South Africa.